Scotia Rewards points are worth $0.01 each, and must be redeemed in increments of 5,000 at a value of $50 per 5,000 points. Ratehub.ca has calculated the value of a Scotia Reward point below. Yes, you can book on multiple airlines. Yes, Scotiabank allows you to pay off travel expenses with points at a later date (up to 12 months after charged to the card). No, there is no expiration date while you are an active member. Points expire 60 days after your account is closed however. One of the unique features of the Scotia Rewards program is that you can make a travel purchase on your own, wait for it to show up on your online account and then apply your points towards the purchase. After you use your Scotia Rewards points towards a purchase, your account will be credited for the full cost in 7-10 days. The Scotia Rewards program also has a full service online travel agency, where you can use points to book travel. Scotia Reward points can be used to cover taxes and fees. The best way to maximize how many Scotia Reward points you can earn is by using a Scotiabank credit card that rewards you more points for various purchase categories. 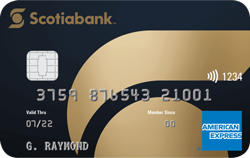 For example, when using the Scotiabank Gold American Express Card, you receive 4 points for every dollar spent on gas, groceries, entertainment and restaurants, and 1 point for all other purchases. Because of the program's felxibility, the best way to use your points would be to use a discount travel site (such as Kayak) to find the cheapest flight on the market and pay for it by applying your points to the purchase. Lets take a look at an example below, to calculate the overall points earned per dollar spent, when using the Scotiabank Gold American Express Card. Using the example spending profile below, we will calculate the total rewards earned a year. In the above example, for every dollar spent, $0.32 were earned (3.2 points * $0.01) that can be used towards travel. A 3.2% return on a card is a great value. However, the problem with this card is that it is an American Express card and many vendors will not accept it. If you are considering this card make sure the grocery stores and gas stations you go to accept American Express (for example Loblaws and Costco do not accept AmEx).